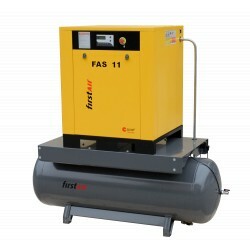 firstAir offers screw compressors with a power range from 3 to 37 kW and working pressures from 8 to 10 bars. Available with receiver (FAS-R), receiver and dryer (FAS-AT) and with speed control (FAS-SC). 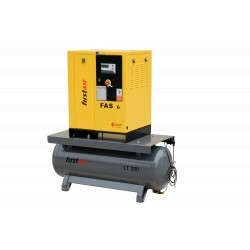 firstAir screw compressor FAS 22 SC - compressor with energy saving speed control, 22 kW power and a volume flow rate from 1.15 – 2.30 m3/min at max. operating pressures of 7, 8 and 10 bar. 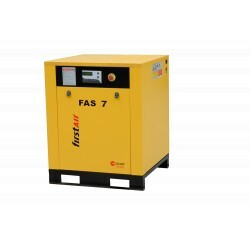 firstAir screw compressor FAS-AT 7 - compressor with receiver (200l) and dryer for high reliability, 7.5 kW power and a volume flow rate from 0.32 – 0.36 m3/min at max. operating pressures of 8 and 10 bar. 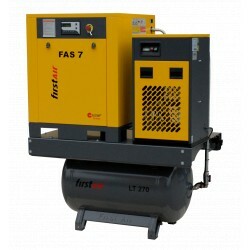 BEST PRICES FOR AIR COMPRESSORS! 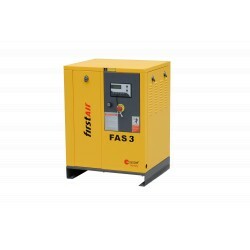 FAS is a complete range of air cooled single stage rotary screw compressors starting from 3kW up to 90kW. 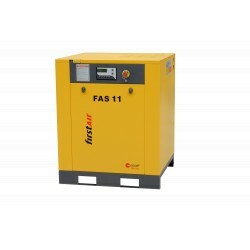 The compressors are designed for heavy duty industrial use and prove their strength when running continuously. 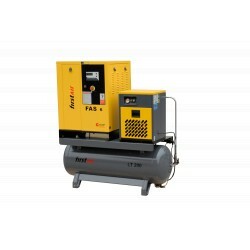 The compressors are equipped with IE3 high efficient main motors which guarantee a very economical operation. 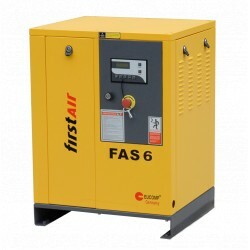 Moreover firstAir also offers its compressors with energy saving variable speed drive. Our standard machines can be equipped with the following options: : Air receiver (11 bar(g)), refrigeration dryer, pre- and post-filters, condensate drain.